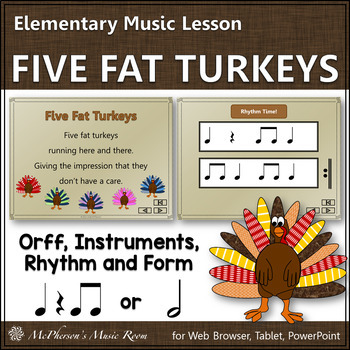 Looking for a fall elementary music lesson, song and activity to use in November around Thanksgiving? Would you like for it to include speaking, rhythm, instruments and form? 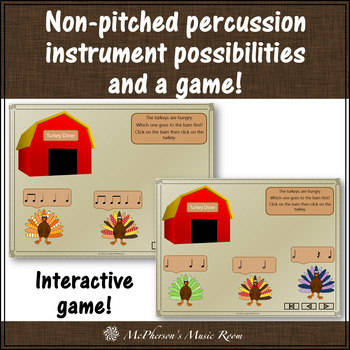 This music activity will be a perfect addition to your Orff lessons and Kodaly lessons! An original speech to teach to your elementary music students anytime but especially every November around Thanksgiving time! Reading, reinforcing and identifying rhythmic patterns consisting of quarter notes, quarter rests, 2 eighth notes beamed is addressed. Adaptations for working with half notes are also addressed along with adding percussion instruments. Your students will love the engaging activities included in the lesson plan and the PowerPoints. •	2 lessons each 5-10 minutes (2 pdf pages) plus an original speech poem with adaptions for half notes. The lesson plans include detailed instructions for teaching the poem, rhythmic activities and instruments to first through third grade. Additional adaptions and extensions are also addressed. 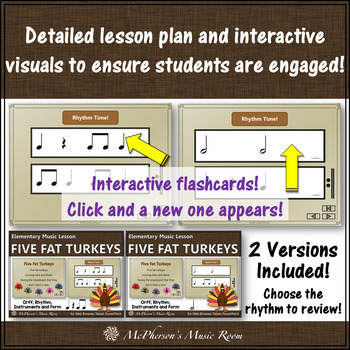 •	34 slides created with PowerPoint 2010 (with 8 slides being teacher and student interactive) may be used to reinforce rhythmic reading and aurally identifying rhythmic patterns. 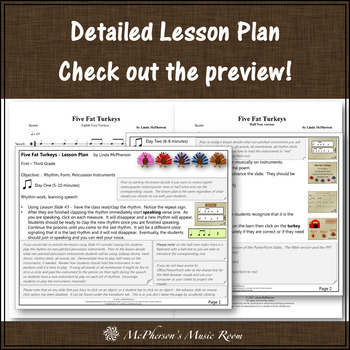 You will have everything you need to teach all the lessons: one PowerPoint to utilize eighth notes and one PowerPoint to utilize the half note lesson. PowerPoints work very well with Smartboards - just touch the board to activate the sound effects and the animations. It is a perfect piece to address curricular concepts while enjoying making music. The product was created to be compatible for Mac's and PC's utilizing PowerPoint. However, please download the preview as a test prior to purchasing!